Indoor and outdoor drinking water fountains and water coolers. Water. A daily requirement. Indoor water coolers and outdoor drinking fountains are now part of modern life and we offer a variety of attractive options to meet your needs. Our commercial products are constructed of durable stainless steel and concrete and designed to last many years. In addition to the “standard” options for water coolers and drinking fountains we offer other products for your “water” needs. We offer products that meet the Americans with Disabilities Act. We offer chilled indoor water coolers for public buildings as well as shower towers and foot washing stations for public beaches. And our most recent and innovation line of products are the pet drinking fountains which have become a virtual requirement for dog parks, walking trails and outdoor gathering areas. The history of the drinking fountain can be traced as far back as the ancient Greeks. They had the same need that we have today – a need for a drink of water in public places. The methods and equipment have changed over the centuries with the last 100 years contributing significantly to the evolution of the modern drinking water fountain. The modern water drinking fountain was conceived and developed by Halsey Willard Taylor and Luther Haws in the early 1900s. They were pioneers in how water was dispensed in public buildings and public places. Mr. Taylor was very motivated to provide clean and sanitary water to the public because his father had died from typhoid fever most likely caused by contaminated water. Initially water that was provided by the first water drinking fountains was not cooled. But the public wanted a cool drink of water during the warm months of the year. Some attempts were made to cool the water with blocks of ice. However this was not a reliable or particularly sanitary method of cooling. What followed was the chilled water drinking fountain. These large refrigerated water coolers were very heavy and used ammonia compressors to cool and chill the water. Later, in the 1950s, the development of the water drinking fountain progressed with changes in technology. The public now wanted a cool, refreshing drink of water at all times and in particular they wanted this availability in the public schools for their children. What followed was the development and design of wall-mounted water coolers for schools and other public places. The water drinking fountain continued its evolution of design and development into the 1960s. During this decade changes were made to accommodate physically challenged people confined to wheelchairs. The result was a water cooler that was more easily accessed by physically challenged people. Many of these designs were wall-mounted units and units that were recessed into walls to allow unimpeded pedestrian traffic in hallways. Later in the 1980s government regulations defined the specific needs of the handicapped. These new regulations spurred the development of the “barrier-free” water cooler and it became the largest selling model in the industry. At the same time there was a push to eliminate all harmful components from the water and particular attention was given to the elimination of lead. There were many changes in the materials and solders used in the construction as well as changes to a less harmful refrigerant, HFC-134a. The 1980s were a period of continued development of the design and appearance of drinking water fountains and water coolers. They became more attractive and more accessible. They became more efficient and offered cleaner water of higher purity. 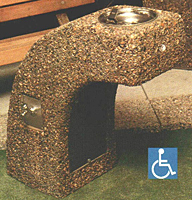 The 1990s saw the passage of the Americans with Disabilities Act (ADA) which set additional standards for drinking water fountains and water coolers. The resulting design changes improved access for both physically challenged individuals as well as able bodied people. Thus a “new” model was introduced know as the bi-level unit. There continues to be a focus on improving the quality of the water offered in public places. New standards have been implemented by the Safe Drinking Water Act and various state legislative efforts. And two testing organizations, Underwriter’s Underwriter's Laboratories, Inc. and NSF International, have been accredited by the American National Standards Institute (ANSI) to certify NSF Standard 61, Section 9 compliance. The water cooler and drinking water fountain will continue to evolve to offer the public a refreshing drink of cool, pure water. Designs will change to offer greater accessibility. But for the moment, enjoy your drink of cool water. XPB Lockers carries a wide variety of drinking fountains, commercial lavatories and sinks,outdoor furniture, commercial bathroom partitions, commercial signage, mailboxes and bleachers systems with professional affiliates ready to help your with your business plan. We delivery nationwide! If you cannot find what you are looking for, please call us toll free at 1-877-483-9270 and we will be pleased to help find it for you. Our home office is located in New Braunfels, Texas with warehouses located throughout the United States that enable us to service all 50 states including New York NY, Los Angeles CA, Miami FL, Chicago IL, Denver Co, El Paso TX, Dallas TX, San Antonio TX, Austin TX, Houston, Texas, Boise ID, Atlanta, GA, Detroit MI, Raleigh-Durham NC, Washington DC, Albuquerque NM, Huntsville AL, Fayetteville AR, Norfolk VA, Madison WI.